In Part 1 of this series, I began planning the 19 maps for my first book. I wanted my maps to look authentic, so for every Photoshop technique I employed, I envisioned how an old-world cartographer would produce the same visual result. This guidance helped me keep my style on point, and the idea of this old-world cartographer took on a life of its own. As I used Photoshop to fade the lines and colors behind text labels, I considered how an old-world cartographer would have had to plan the whole map ahead of time, reserving space for each label before even inking the map's coastlines. I contemplated more old-world analogues for my Photoshop techniques, and I started thinking about how ancient artists would have benefited from the sort of magic I envisioned for the Known World. While painting my maps in digital watercolor, I thought about how an Known World cartographer could have known a bit of water magic, allowing him to better control the flow of color onto paper. Other old-world mapping techniques became easier through magic, and magic also allowed for entirely new mapping techniques only possible for cartographers in the Known World. I continued my map-making adventure, creating a total of 19 maps for my first book. As I mapped, I kept notes on my techniques and their applications, codifying my approach so that all 19 maps employed the same techniques and Photoshop settings. During this studious phase, I found more inspiration for my old-world cartographer - instead of a master of his craft, this map-making character was actually an apprentice. Just as his old-world techniques mirrored the visual results of my digital techniques, his development as a cartographer mirrored my own development. When I had to go back through a number of maps in my Tales of the Known World saga to make updates and adjustments, I envisioned this apprentice cartographer remaking a number of his maps to correct mistakes and hone his artistry. I came to imagine this apprentice cartographer mixing paints, creating rough map drafts, and agonizing over the painstaking details of his finished maps. Of course, this apprentice needed a master cartographer to study under, and I began wondering about the master's story. Where had he learned his mapping skills? What drove him to take on an apprentice? Slowly, a character emerged for the master, and his story filled in. I envisioned my first book, Awakening, as a legend in the future Known World, with the actual text of the book written by the wise and well-traveled master cartographer. 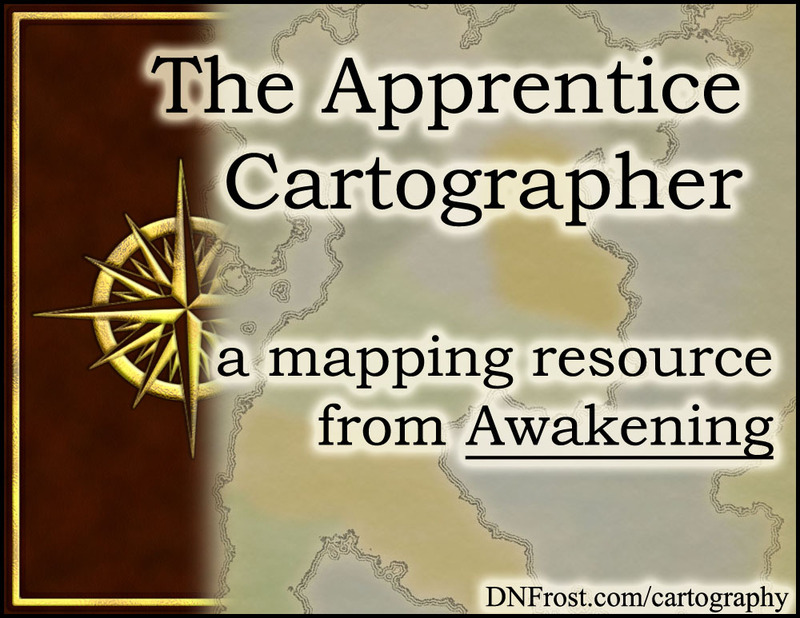 For his apprentice to hone and demonstrate his skills, the master assigned him the task of illustrating the Awakening story with 19 maps of the lands where the tale took place. But Awakening is just one of many books, so my master cartographer must be training a number of cartography apprentices. Each book in the saga is the work of a particular apprentice, so the maps of each book are internally consistent but differ from other books in style and technique. That's it for this series! Check out the latest mapping resources for more.